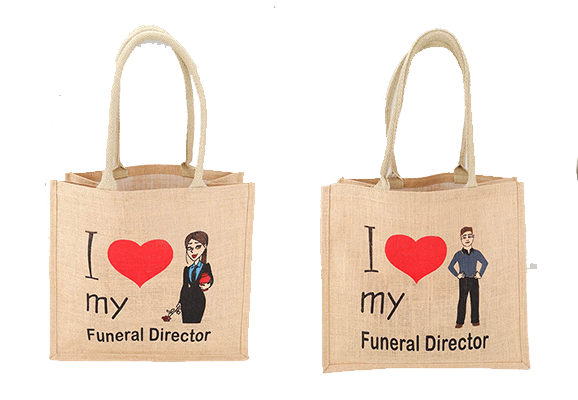 This new bag design is popular with Funeral Homes and Crematoriums everywhere. Great for “service urn and/or cremains returns” these bags will make a lasting impression on your customers as they fondly appreciate your kindness and care during such a difficult time. These bags come with comfortable padded handles which make transport easier. They can also be worn on the shoulder for added value and comfort. Jute bags are strong, wear extremely well and will last several months or years depending on use. These re-usable bags are the future! Let’s all do our small part removing some portion of plastic and nylon packaging from the environment. Dimensions: 11.25" x 7" x 14"